Note: This article was originally published in Interference Technology’s 2006 Test & Design Guide. Testing services and equipment are now available to analyze designs for fibrous dust susceptibility. 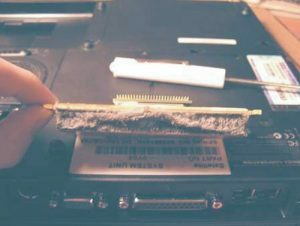 Accumulations of dusts have always hampered cooling, to some extent, but dusts and electronics cooling problems of the past usually involved industrial or military applications. To understand why dust has become such a menace, we should first look at the new technologies of heat removal. These technologies have evolved to remove tremendous amounts of heat in small packages. The new designs include everything from close-coupled fans and/or self-contained heat pipes, to recalculating coolant systems using liquid metals. Though quite different in design most have two things in common. They have fine pitched fins to maximize surface area and they require high air flows through the fins. If you have, any doubts as to the seriousness of this issue just type, “heat sink dust” into your favorite search engine and see what happens. Last time I did, I got 4.4 million hits! The combination of fine pitched fins and high airflows can remove a lot of heat but they also collect a lot of dust! Figures 1, 2, 3 are just a few examples of heat sink contamination you can find on the web. Like most test labs, we try to use standard tests methods whenever possible. Our client was looking for a test to duplicate field dust problems in laptop computers. We recommended settling dust testing similar to IEC-60068-2-681 and MIL-STD-810F2. The only modification to these methods was to increase the concentrations of injected dust because a highly accelerated test was required. However, these tests proved inadequate in duplicating timely failures even at grossly unrealistic test levels. Further information from analysis of the failure dust clogs reveals the reasons. Fiber is all-important! The test media must contain a similar variety of fiber lengths and smaller particles to duplicate the clogging action to facilitate failures. The longer fibers bridge the leading edge of fine pitched fins building a mat of tangled fiber. The reduced airflow causes the processor temperature to increase which in turn causes the fans to increase in speed. More air flow keeps the processor cool but brings in more contaminates. 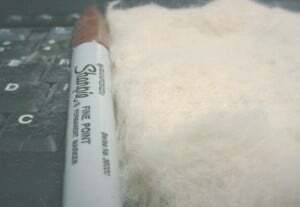 The longer fibers soon block the airways to the point where smaller fibers and dusts begin to collect on the fiber mat. The contamination buildup escalates to the point where almost no air can pass. To compound this problem the fan impeller can suddenly loose the ability to move air in the intended direction once the backpressure reaches a critical level. When this happens, the pressure differential across the heat sink can also drop to zero. The product now has serious thermal problems. At room temperature, the processors will generally self protect shut down but damage from excessive temperatures is always a possibility. The inability of the fan to move air properly can also lead to other parts of the system overheating. These secondary overheating problems occur when the heat sink fans are also used to draw cooling air through other parts of the system. I would love to say I had an answer to all fibrous dust contamination problems. Later in this article, I will offer up my ideas on solutions. Right now though, I am just a test person trying to answer another daunting question. How can I test the immunity of a solution or the susceptibility of new a design? There seems to be no good answer, all dust test equipment and methods used fine particles and powders. The tests in general were designed to test products with air filters. In consumer products, where “filter” is a dirty word, there is a whole range of contaminates these tests do not address. 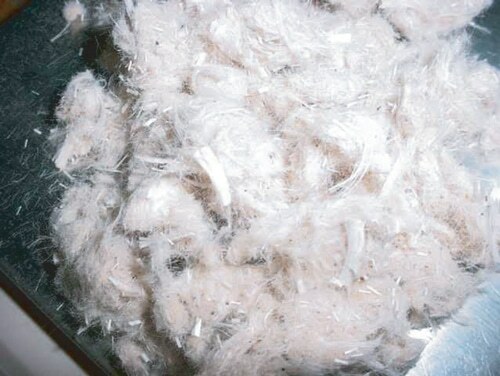 Existing test methods and equipment cannot duplicate the fibrous dust failure mechanism nor can they be adapted to disburse fibrous dust mixtures. Without equipment and methods to duplicate a problem, effective testing of a solution is nearly impossible! Figure 4. Pre-injected dust mixture. It started with my search for fibrous dust test media; I got many helpful suggestions from my colleges. Most involved cleaning their houses or changing their vacuum cleaner bags. Actually years ago I was part of an experiment that used vacuum cleaner dust as a test media. The experience had left a bad taste in my mouth, literally. The obvious consistency and repeatability issues of using natural dusts is so formidable, formulating a synthetic dust media is the only real choice. Environmental dust contaminations contain fibers and particles from a near infinite number of sources. The percentages of each ingredient in a synthetic dust should mimic the general physical size properties of actual field return heat sink contaminations. However, getting a variety of cut fiber and mixing with standard test dusts components created a tangled clumpy mess that at first seems impossible to disburse in any controlled fashion. (See Figure 4.) I stared at the first batch like a cat that had just coughed up a giant hairball, wondering what to do next. Nothing I had ever seen could disperse such a mess and I had to make it happen. Figure 5. Cycloclastic dust generator. Figure 6. Settled dust, chamber floor 16-hour accumulation. Previous testing with non-standard dusts held part of the answer. A system of air randomizers I had used to propel large lightweight particles in a special application dust test was a good start.The randomizer design was incorporated in a chambered system combined with a high volume jet pump.The first prototype worked better than I dreamed possible! It is totally powered with compressed air. It has no moving parts to jam or clog and can function well in the worse dust environments I have ever seen. Within a couple of weeks, we were reproducing field failures in as little as two hours of test time. Figure 5 is a simplified drawing of the dust generator and Figure 6 demonstrates the generators effectiveness. Accelerated testing with fibrous dust produced issues not seen in standardized dust testing, even at equally accelerated levels. The first problem had to do with air-inlet clogging. 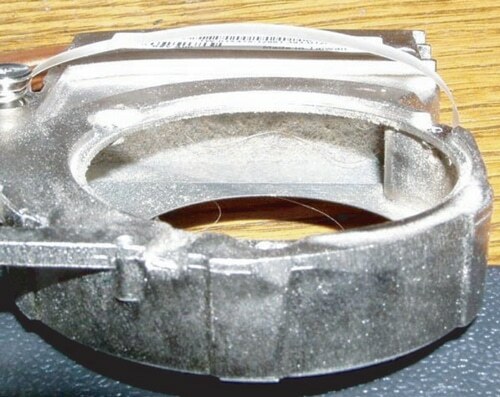 While inlet clogging can be a design concern for stationary products, it is less problematic for portable equipment. Portable equipment such as laptop computers are likely to have input air vents cleared of dust accumulations through handling and normal use. In addition to frequent handling, the user of portable equipment might actually see these accumulations and periodically clean the inlet vents. In accelerated testing, fibers tend to form a natural filter on the inlets before heat sink clogging can occur. This action causes only very small particles to reach the heat sink and stops the fiber failure mechanism from occurring. To facilitate normal use actions and allow heat sink clogging to occur, periodic clearing of input vents is a test method necessity. (I thought I could just start it up and comeback at the end of the day. Wrong!) Likewise, it is unlikely a two-year blanket of dust accumulation will ever be present on the surface of a laptop in use. (Except for maybe in my teenaged sons room) The periodic clearing of dust buildup stops an unrealistic thermal blanket from forming that could disrupt radiant heat dissipation or block topside air vents. Figure 7. 16-hour dust accumulation. Figure 7 demonstrates how thick the dust layer would be in a 16-hour test. With periodic inlet cleaning, the settling dust test method can duplicate the fiber clogging failure mechanisms in portable computer heat sinks. However, even with inlet cleaning the heat sink accumulations tended to contain higher concentrations of fine particle dusts and lower fiber content than desired to correlate to field data. While it may seem logical to assume the synthetic dust mixture requires adjustment (i.e. 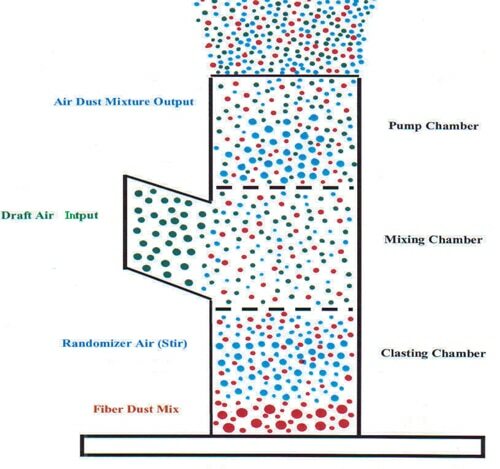 reduce the fine particle dusts vs. fiber), we must first look at how dust enters these systems. The second is from passive dusts previously settled on surfaces or from direct contact with dust producing materials. Figure 8. Passive-only dust test accumulation. Figure 9. Active-only dust test accumulation. Figure 10. Combination active/passive dust test accumulation. Early experiments in passive only dust testing, resulted in an opposite results of active only, with high fiber content clogging of heatsinks and relatively low concentrations of smaller dust. The bottom facing fan inlet creates airflows that tend to vacuum up fibrous dusts leaving finer dusts behind. An adjustment made to the dust mixture in active testing resulting in accumulations close to field compositions would still seem an effective test method. Test experiments prove this method worked quite well as long as all laptop designs remain the same. However, any design with only top or side air-inlets could eliminate most passive modes of ingress. Because passive (settled) dust concentrates on surfaces, such a system could prove to be more robust in actual use, yet it would be at a distinct disadvantage in an active (settling) mode only test. It is apparent that any realistic evaluation of future portable system designs must include both active and passive modes of dust ingress. Figures 8, 9, 10 demonstrate the differences in accumulation composition using active, passive and the combined active/passive test methods. Passive test experiments were extremely labor-intensive requiring moving the test units every 10 minutes to a new pre-dusted location. The process also required once per hour removing the units, cleaning the test accumulation surface, and recoating with dust. Being the guy that has to run this test, I was VERY motivated to design a prototype-rotating fixture table to simulate both modes of dust ingress. The table design also facilitated bottom air-inlet cleaning with rotating brushes at 10-minute intervals. This brush action reduces problems with inlet clogging and simulated direct contact passive dust ingress from clothing, carpet, etc. The periodic table rotation also produced a significant benefit in dust uniformity. Achieving uniformity location to location within a settling dust test chamber is always difficult. A requirement to test multiple units simultaneously brought this issue more attention. The periodic rotation of this design caused each unit to travel to all possible locations therefore; they will all see the same average level of dust over time. As expected, the prototype fixture produced accumulation results very similar to field returns. Figure 11. Dust test chamber accommodates active/passive testing. 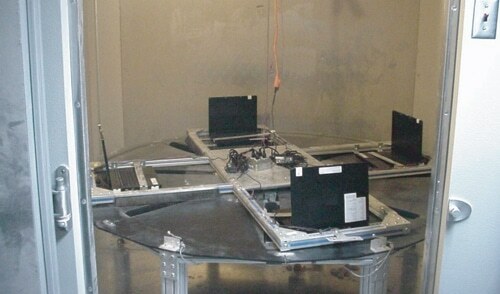 To accommodate multiple samples, and larger laptop computers with a combination active/passive mode test table, a larger chamber was required. The thermal nature of failures also requires heating and cooling control. The system must provide a stable temperature environment with changing thermal load handling capability. Low humidity maintained within the operating temperature range of a variety of product types is also essential. 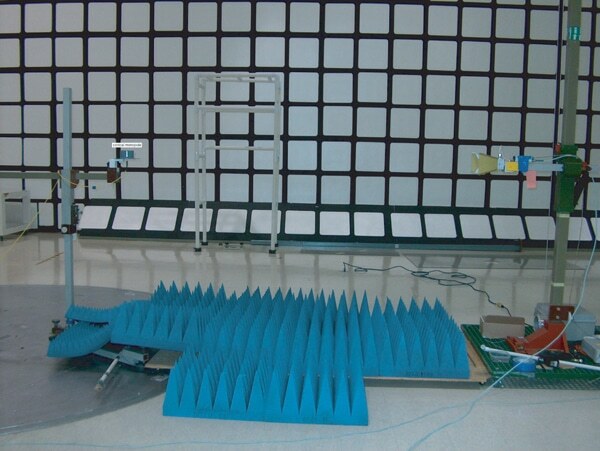 The DT-550 test system design (Figure 11) satisfies these test requirements. The chamber can accommodate the AP-550 rotating combined active/passive test fixture that is large enough for four portable computers with up to 21” screens. The system can also facilitate testing of desktop and server products as well as most products where fibrous dust contamination is a concern. I must add these test systems are now marketed by Compatibility Products Corporation. 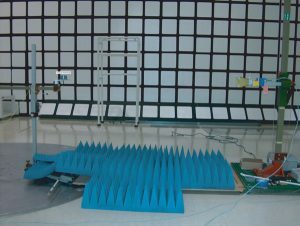 While I am not a thermal design engineer, I have done many hours of research and have made some interesting test observations. While some of my knowledge is empirical and some intuitive, I can offer my insights into fibrous dust contamination solutions. Solutions I see fall into general categories of heat sink design, system design, and software design. It is likely the best solutions are some combination of all three. Fin Shape: Sheared metal fins with square sharp edges accumulate dust faster because the edges snag the fibers. Using laser or water cut fin materials could reduce the rate some but cannot eliminate the problem. If practical for the application, molded fins with rounded edges reduce accumulation rates best. Air speed/Direction: High velocity fans blowing directly at the fins cause higher accumulation rates because the faster the dusts are moving the more likely they will snag, impinge, or wrap around the fin leading edge. Drawing air through the fins can reduce the rate at which the clogging occurs with only a small decrease in cooling efficiency. 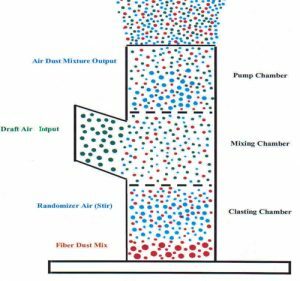 Air speed and direction considerations can reduce dust accumulation rate but cannot eliminate the issue alone. Fin Spacing: The wider the fins are spaced apart the less likely the bridging of fibrous dusts will occur. Fin pitch of greater than 2mm can reduce the rate of accumulation but cannot resolve the problem alone. The trade offs of surface area, cooling efficiency, and overall heat sink size, unfortunately often makes a wide gap approach impractical. Thermal Margin: While the margin of a thermal solution alone cannot insure dust issues will not arise, generally more margin equals longer time to failure. High thermal margin can mean lower airflow is needed, and reduced airflow means less dust accumulation. Last But Not Least: Just use the secret magic coating that has no reduction in thermal transfer properties yet repels all airborne particulate matter. To my knowledge, it does not exist yet but it would do the trick! Filters: Air filters have been used for years to prevent fibrous dust contamination on AC cooling evaporators, as well as industrial and military electronic equipment. They work well and provide good protection from these types of dusts. However, the issues of maintenance and design restrictions make this solution impractical for most consumer equipment. Many products use vents in various case locations and evacuate air from the case for cooling. This is an excellent approach to provide localized cooling in many areas of a chassis using the fewest number of fans. However, to filter the input air would require filters at every input vent. The aesthetics and maintenance issues of such a system would be enormous. There is also the mindset in consumer electronics that any type of routine maintenance is very undesirable. However, it may be possible to design in incidental filtering. In portable equipment for example, very small inlet air holes or fine screens could act as fiber filters and be cleared of accumulations during normal handling and use. Air-Inlet Location: If air-inlets can be positioned away from areas of high dust concentration the rate of accumulation is lowered. Air-inlets closest to the floor usually see higher concentrations of dust in freestanding equipment. Likewise, air-inlets on the base of portable computers can ingest large amounts of dusts that settle and concentrate on surfaces where the unit is likely to be placed. Moving the air-inlet to the top or side can reduce contamination considerably. It may also be possible to use the case and other components of the system as a sort of filter. 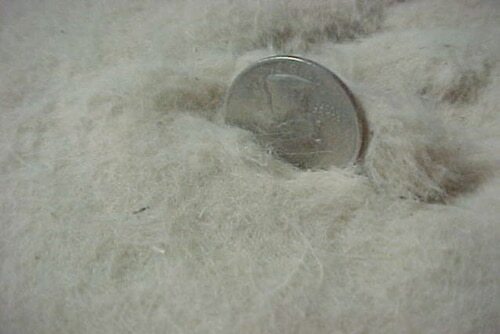 Fibers can be allowed to collect in other parts of the system where cooling is not such an issue. Secondary Cooling: One of the interesting things I have observed is that fans will move air even when it cannot go where it is suppose to go, or rather when its intended path is blocked. 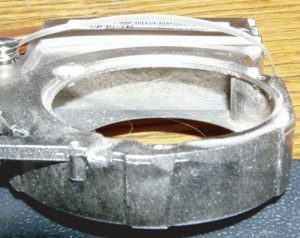 An interesting example is the small centrifugal impellers commonly used in laptop computers. These fans usually draw air in both sides and blow it out at 90º through a set of close-coupled heat sink fins. When the fins are clogged with dust, these impellers draft air in the side without the motor and blow air into the chassis. Secondary airflow could be used to “limp along” until service or cleaning. Though this may not be an optimal solution it might just keep a system up, that would otherwise go into thermal self-protection shutdown. Self Cleaning: While this may conger up images of tiny robots or some mechanical contraption resembling a self cleaning cat box, it may be possible to design in some self cleaning ability into a thermal solution. The most practical one I have seen proposed reverses the airflow through the heat sink periodically. This idea is probably impossible for many designs but it is simple enough it might just work for some. It would require some hardware design modifications, and possibly software as well. Software solutions to dust contamination may seem far-fetched however, there are a few things that can help more than one might initially realize. Cool Down: The ability to monitor processor temperatures with software brings new possibilities to dealing with dust related thermal issues. Combined with the ability to reduce processor(s) temperature by forced reduction of the clock speed, the software can also minimize thermal protection shutdown occurrences. The throttled processor speed obviously results in lost performance. However, slow is generally considered better then dead, especially in the middle of editing a large file! It may even be advantageous to have older systems slow down. Just imagine a user trying one of you new systems when his old one is running at half speed. Green is Clean: Portable computers have used the ability to slow down processors and reduce fan speeds to conserve battery life for some time. These software-controlled features could be incorporated in other systems as well. Throttling the processor speed (when not needed) and thereby dropping the fan speed will reduce the dust intake. The reduction of processor speed should have only a minimal effect in certain applications. I know my desktop system runs at full speed all the time, and I certainly cannot read, much less type at 2.8 Gigahertz. Power generation also causes pollution, so by saving power, who knows you might even save a whale or something. Full details of the testing performed to date, remain client confidential. However, over 80 tests on dozens of designs have produced a stable repeatable test process. A significant number of the products tested had known field performance histories, and the test results correlate with those histories. Products with no history of dust related issues generally do well in fibrous dust testing, while those with histories of dust complications have problems. With ever increasing semiconductor performance, the demand for high efficiency cooling systems will continue to progress. The effects of fibrous dusts on these systems will be critical. Industry standard test methods and criteria for fibrous dust testing do not exist at this time.However, the methods and equipment described in this paper have proven to be effective at producing realistic results. Even if test standards are developed, manufactures will still have to assess risk based on individual product dust evaluations and best engineering judgment.Accelerated testing early in the design process is always a good idea regardless of the type of environmental stimuli applied. Testing for heat sink/system immunity to fibrous dust contaminates is a crucial step in identifying problems and assessing risk. While there appears to be no easy solutions to fibrous dust contamination issues, testing services and equipment are now available to analyze designs for fibrous dust susceptibility.An accurate test to reproduce a problem is always the first step on the road to successful solutions. Those that choose to test for these problems early will advance, those that choose to ignore them will be “left in the dust”. Dan Willemin has 30 years experience in the environmental and reliability testing of computer products and peripherals. Much of his career has been working with major companies including Texas Instruments, Tandem Computers, Compaq, and HP. In 2003 he joined Professional Testing Inc. as a Reliability Test Specialist, where he designed his first custom dust chamber specialized for hand held device testing. Since then he has developed several innovative designs for customized dust testing using unique types of dust media. He has two patents pending award for his efforts in accelerated dust testing equipment designs.